Is the giant starting to wake up? When Stagecoach came in and took over the ailing First operation in Plymouth there were many people here to commented that it would quickly see off competition from Plymouth Citybus and put them back in their place. The reality was very different with SC seemingly happy to stick to their main key routes and leave the rest to Citybus. Citybus for their part scaled back their incursions into Devon and have put their efforts into the Cornish side of the Tamar. From 3 September we are making changes to our Plymouth bus services, the first significant revamp of our services since we took over a number of routes from First Devon & Cornwall in September 2015. Many of the changes are possible because of the new bus priority infrastructure in and around Derriford Hospital. This means we can run all of our 1, 100 and 101 bus services via the Hospital. There will be buses up to every 7-8 minutes between the Hospital and city centre and buses up to every 15 minutes between Hospital and The George and Milehouse Park & Ride sites. There will also be a direct all day service between Plymouth Station and Derriford Hospital. All 1 service buses will now run every 15 minutes on the same route from Tavistock through Marjons, Derriford Hospital and Mutley to the city centre. Anyone travelling from Tavistock to the railway station can change at the Hospital and board either the 100 or 101 which will go from the same stop. Alternatively, they can continue their journey on the 1 and walk the short distance from Mayflower Street. 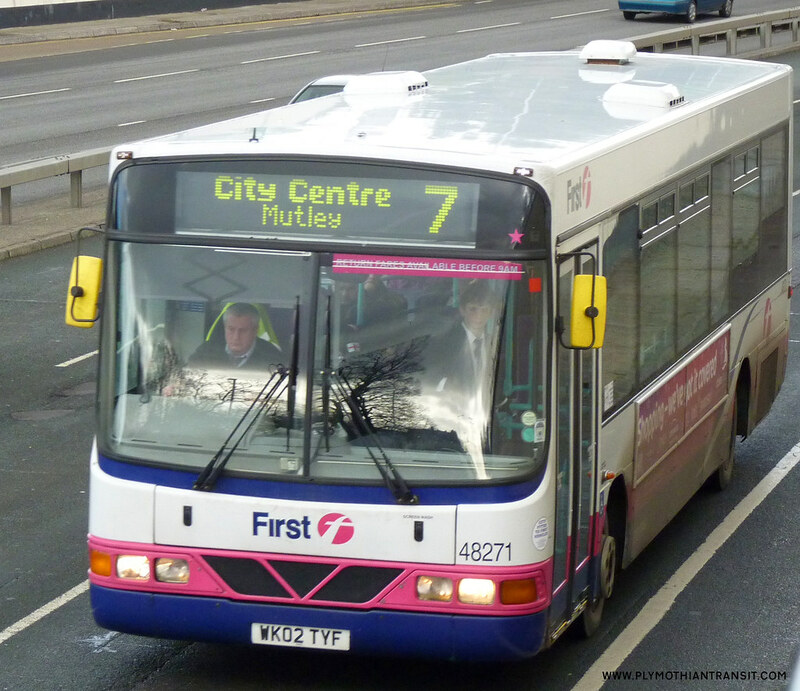 In Plymstock, there will be buses up to every 5 minutes to the city centre. Mount Batten will have a new service – the 2B – which will run up to every 20 minutes between Royal Parade and Mount Batten. Both the 2 and 2A will run to Elburton which doubles the frequency to this part of the City and gives more cross-city connections to Plymouth Station, St Budeaux and Saltash. In partnership with City College Plymouth, we are also taking over operation of route 36 between the College’s Kings Road Campus and the City Centre. The timetable will include more journeys into the evening for students taking part in activities, study and training after the core teaching hours and the general public are also welcome to use this service. This will bring competition on the Derriford corridor back to pretty much what it was back in Firsts day with the 7s along with some of the Tavistock runs. Stagecoach have always been cheapest but the infrequent buses may have put people off committing to season tickets. It will be interesting to watch when all this kicks off. I am sure there is enough custom for both companies along this section - but I would not be surprised to see some additional marketing by Citybus prior to these changes in September! On the other hand pcb 45 may get people who used stops the x1 served. Not a local, but won't the 101 serve the X1 route between Derriford and Plymouth now? Isn't it coming off with loss of 46 tender? The 45 and 46 are being withdrawn. The contract for the 46 (Tavistock-Okehampton) passes to Dartline after 2nd September, when it will be renumbered 118. As the 45 is effectively just in-service positioning journeys for the 46 it too will no longer operate after this date. This is great news. Love the new '1' timetable. I think I will use this service more come September. Not sure we are a the start of a bus war as yet but definately signs that Stagecoach are ready to fight for bigger slice of the cake on main corridors though. reckon they found a market gap for a quick route from rail stn to derriford. much quicker than citybus 50/51. question the rest of it though, is it actually any use ? nice to see a bit of competition though , makes things interesting . Stagecoach only keep their prices down when they have competition. As soon as they have the route to themselves they increase their prices. Just as they have done in Ivybridge and in Tavistock. Clearly Stagecoach have bided their time to decide what they'd do in Plymouth. It will be interesting to see what the outcome of this will be. Not sure it's enough to turn its struggling ops around? Wonder if Stagecoach need to add to their Plymouth fleet for these changes.......certainly with Torquay due a load of new deckers for the 12 shortly, perhaps the cascade resulting will help Plymouth? Is Stagecoach struggling? It is a well-run group which knows what it is doing - it has taken its time to assess the market and you may be pretty sure that it is not going to start any new services which will not succeed. We seem to have moved in stages from a situation where Council-owned Citybus held a steady hand against a First which tried all sorts of ideas which never seemed to last very long; now we have quite a lot of chopping and changing from Go-Ahead-run Citybus against a measured development of a viable network from Stagecoach. It will be interesting to see, for example, where all the sparks and flashes are in four or five years' time. SC are clearly being very cautious in Plymouth which is a good thing. They are cutting back in many areas as a group including some cuts in Exeter but Plymouth has not seen any cuts yet - although there is very little to cut back on! I am less enthustastic at how the council held their own against First - they certainly didnt invest in the business anything like they needed to. GA have put a lot of money in and transformed the fleet. Unless there is an all out bus war which I think is highly unlikely things will continue pretty much in the same vein as they are now and the new Spark and Flashes will still be here, along with plenty of other new buses. There is no reason why both companies cant exist in Plymouth both with modern fleets - something we didnt have in Plymouth for many years. 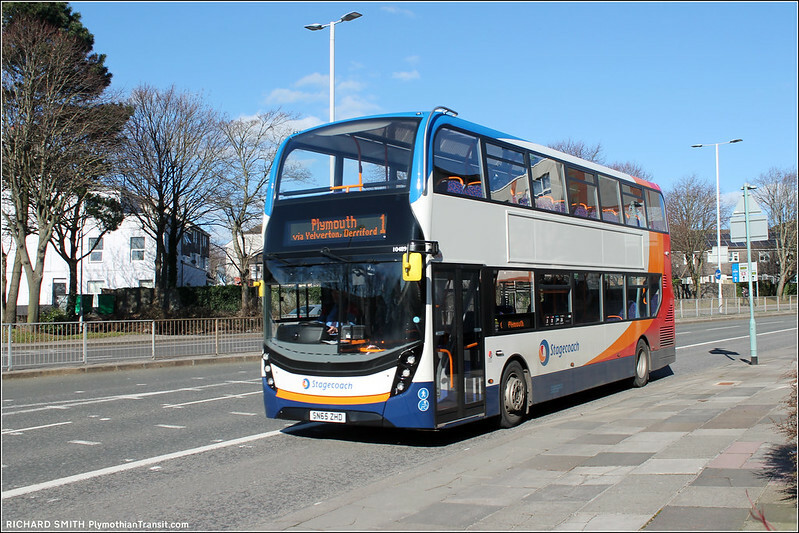 The Plymouth ops are said to be the worst performing region within Stagecoach Southwest. Something I would like to see if PCB go more corporate and get rid of the flashes and sparks, as it was only brought in to show off the new investment. And maybe establish a proper brand for its Cornwall operations. Stagecoach aren't doing very well at all at the minute, they have overpaid for the East Coast franchise, they have lost South West Trains and a lot of their bus services have been cut or reduced, especially in Exeter and South Devon where people are getting fed up with a half hour 2 service which is always running late! Yes, I take your point, Graham, and I certainly agree that the age-profile of the two fleets together is way ahead of what it was a few years ago. You say that the Council didn't invest much - or perhaps just added new buses a few at a time - but First hardly invested at all; they were slow to get rid of Mercedes minibuses and the VRs seemed to last longer here that almost anywhere else in the country. Deregulation was a long, long time ago now but - apart from a couple of flare-ups - Plymouth has kept an unusual pattern of each operator keeping to its own set of services and not deliberately running in parallel over complete routes. I don't predict a flare-up with Stagecoach. Stagecoach service 1 buses now advertise every 15 minutes Mutley, Derriford and Marjons down side of buses. Seeme like they mean business here.